Most equine lameness results from leg injuries or hoof ailments, not diseases. That doesn't mean that diseases don't strike equine limbs. Call your vet at the first sign of any lameness or swelling in your horse's leg. Equine leg diseases often result from infection, and they require prompt treatment to save your horse's life or his future soundness. Some equine leg conditions are subtle -- your horse just seems a bit "off." That's not the case with lymphangitis. The affected limb swells up severely and can become quite hard, leading to "stovepipe leg." Your horse's lymphatic system, crucial to immune response, helps get rid of toxins in his body. If this drainage system is out of whack, fluids start collecting and the swelling known as edema forms. Mild edema often responds to movement, but your vet will need to examine your horse to determine the cause of the swelling, which can result from heart failure, infection or trauma. Cellulitis occurs when bacteria invades your horse's connective tissues. While it can happen on any part of the horse's body, cellulitis often develops in one or both of the rear legs. The leg swells and is painful when touched. The horse might be in so much discomfort that he won't bear weight on the affected leg. A horse might develop cellulitis not long after experiencing a wound on the leg -- and that's an easy way for an infection to start. Cellulitis spreads quickly, so get your vet out as soon as possible. She will likely prescribe antibiotics, along with pain medication, after culturing the fluid in the swollen leg and identifying the bacterial culprit. The vet might recommend bandaging the leg after applying substances to draw out the fluid. Neurological problems vary. 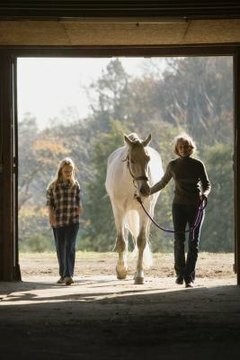 Your horse could stumble frequently or display intermittent lameness. He could also lose control of his legs, fall down or become paralyzed. Common equine neurological diseases include West Nile virus, equine protozoal myeloencephalitis, or EPM, and equine herpesvirus type 1. Another disease that can cause neurological issues is perhaps the most devastating of all, rabies. It's 100 percent fatal, and your horse can pass it to a person or another animal via biting. Rabies, West Nile virus and equine herpesvirus are considered core vaccinations -- if you keep your horse up to date on his shots, they shouldn't be a concern. EPM results when protozoa invade the horse's central nervous system, harming the brain and spinal cord. While EPM is treatable with medication, it's a long-term process. Some horses don't recover completely. Equine neuromuscular disorders are usually most obvious in the legs or in the horse's movement. Equine polysaccharide storage myopathy, found primarily in draft and warmblood breeds, causes problems with carbohydrate metabolization. Affected horses might exhibit gait abnormalities, lameness and stiffness. Related disorders include "stringhalt," in which the hind leg movement becomes greatly exaggerated, and shivers, in which the horse holds his hind leg up for brief periods and shakes. Dietary changes, in which carbohydrates are replaced with fats, might help horses dealing with these metabolic issues. Draft Horse Journal: Doc, What Is Lymphangitis in the Horse? What Is Foundering in Cattle?